When I was a teen, I absolutely hated “sharing” a book. I define that as having two people reading the exact same copy of a particular book. To wit, I pick up the book and read to page 45. I go outside to do my Saturday chores. I come back in the house when done said chores to resume my reading and find the book missing. When I finally find the book, it is in the hands of someone else. They are reading it. That, in my book, is wrong. Now, as an adult, I don’t mind so much. Often I encourage it with my children. I enjoy reading part of the book. Then, while one of my kids is reading it, I can ask them questions about how they are enjoying the book. And we can chat back and forth about what is happening in the book. It actually makes the read much more enjoyable. When they set it down, I pick it up. Back and forth it goes. On Friday, the newest Brandon Sanderson book showed up. 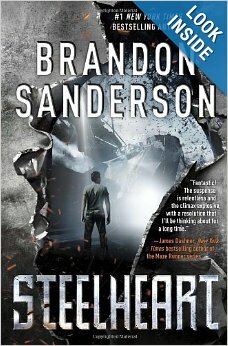 Entitled Steelheart, I was extremely excited to read it. If you haven’t read any of his books, Sanderson is amazing. Not only is he good, but he just keeps cranking them out. Prolific doesn’t even begin to describe his pace. So on Friday night, I read about 50 pages of Steelheart. WOW! I was hooked. But on Saturday I had a bunch of stuff to do–mostly involving finishing the chicken run that I set the posts for last Saturday. So I went out and finished the project. From time to time, as I came in to get a drink or another needed tool, I noticed my son was reading the book. He and I share a similar taste in books. I was excited to get his take on the book. In the afternoon, I finished the fence. I asked him how the book was. He was enjoying it immensely. Later, he took off with some of his friends. I wasn’t too sad because it meant I got a crack at the book. I got about halfway done before other concerns took me away from the book. On Sunday, we both finished the book. What did we think? We both think Sanderson has a winner here. The action was fast and the characters were loads of fun. There are enough twists and turns that the book keeps you guessing. I am calling it right now–this book needs to be a movie. My son agrees. And of course, when you are done the book you are going to want to read the second in the series. It isn’t out yet, but considering how fast Sanderson writes, I’m quite sure it won’t be long. I’ve come to the conclusion that sharing a book is fun. Especially if the book is great and the person you are sharing it with is one of the greatest.